Glypha is a Joust-like game by john 'Scheherazade' calhoun. I love the game, and so I've devoted this little corner of my website to it. The original. Runs in a 512x342 window in the center of the screen, in black-and-white. Amazingly, it still works in Mac OS X — it is truly a testament to the backwards compatibility of the Mac. It is also the most configurable of the Glypha family. The first couple of levels do not have the lava pits; they are opened when you enter level 3. The sequel is basically the same as the original Glypha, but graphics are 16-color at 640x480. As a result of the added screen space, the score and lives totals are now displayed all the time (in addition to a new level counter), rather than only between levels. 256-color in a 640x480 window. It is markedly different from the first two Glyphas; the lava pits are open all the time, and the physics are much more realistic. The graphics are prettier, too, of course. The Hand moved to the other side, you get three lives instead of five, and the arrangements of platforms changed. 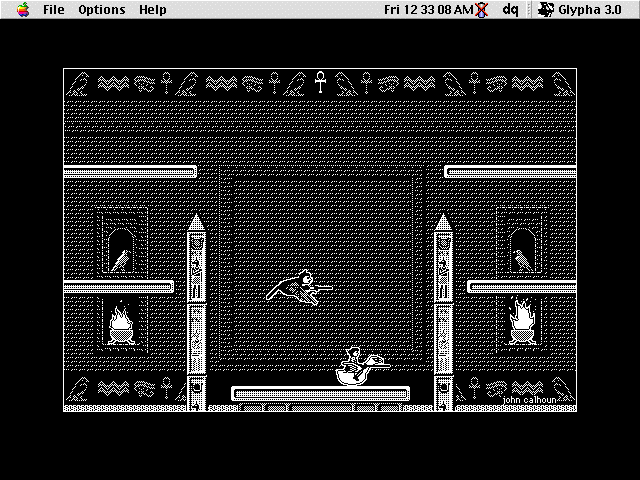 There is a Mac OS X Glypha III porting project underway. Glypha IV using full-screen (256-color, 640x480) DrawSprocket video. Also adds pixel shatters (explosions) and score floaters. Otherwise the same as Glypha III. The source code to Glypha III and IV is available, so naturally (in my hacker spirit) I've made some improvements to it. I've made improvements to Glypha III; most importantly, stereo panning sound. Eventually I hope to submit my changes to the project. I'm archiving all games of the Glypha series that I can find. All the Glypha and Glypha II archives are for Mac OS; all Glypha IIIs and IVs are for Mac OS X unless otherwise identified. Also, none of these are Universal Binaries. It would probably be quite hard to convert any of these to run on the Intel architecture. Feel free to have a swing at it, though. I also have a collection of Glypha screenshots. 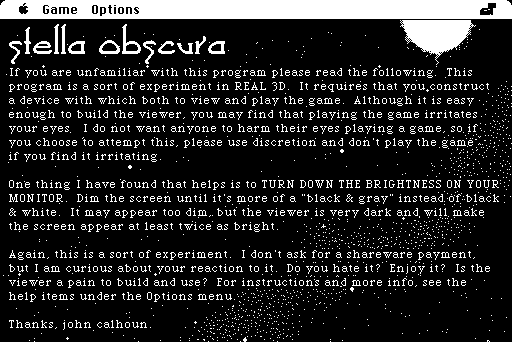 John Calhoun also made a game called Stella Obscura. 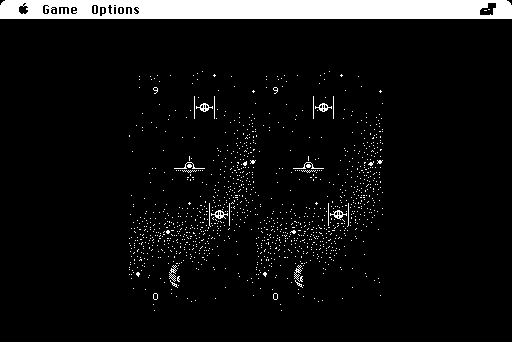 It's one of the earliest examples (that I know of) of a video game application of stereoscopy. The game shows two versions of the field of play, and includes instructions on making a cardboard viewer, which restricts each of your eyes to only one of the images. The result is, as the intro screen describes it, a “REAL 3D” illusion. Both of these require a 68000. I don't know whether they work on later 68020-generation machines or on PowerPCs. Additionally, Steve White kindly provided me with a separate copy of the Pascal source code to Stella Obscura 1.0, along with some Glypha source code which I listed above—thanks! The Stella Obscura 1.1 application uses a different color icon family (gray viewer instead of brown, and no handle) that matches the black-and-white icon used in both releases. This latter icon is the one next to the heading of this section. Glider+ 3.1.2 and Glider 3.14 have a color icon; the earlier versions do not. From this, my guess is that 3.1 was the first color version. John Calhoun has made Glider PRO and Glider 4.0, including the Mac OS X version of the former and the Windows version of the latter, available for free. In addition, there is a Flash version of Glider PRO named Glider Web. There is also an NES/Famicom port of the original Glider available. Mark Pazolli's porting project (mentioned earlier). Provided as example source code by Apple. A Cocoa Touch port, based on the Glypha IV source code, by Kent Sutherland. Japanese translation based on Mark Pazolli's OS X version. Ported by Thomas Rogg. Requires DirectX 7. Bill Amend's total-conversion of Glypha III using the Slug-Man and Paige-O-Tron characters from his FoxTrot comic strip. Available for Mac OS and Mac OS X.